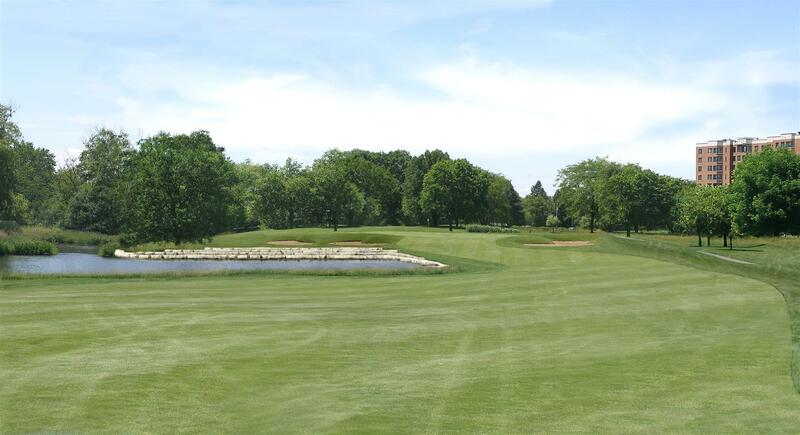 Hoffman Estates, Ill. – The multi-million-dollar capital-enhancements program at Poplar Creek Country Club is complete, and the popular Hoffman Estates golf and events venue will now be known as Bridges of Poplar Creek Country Club. With major renovations resulting in optimal playing conditions for golfers, nine holes will open for 18-hole rounds on March 26. All 18 holes will open in early June. The addition of “Bridges” to the club moniker parallels installation of eight wood bridges along the 6,500-yard course. Plaques paying tribute to professional golf legends Bobby Jones, Chick Evans, Samuel Ryder and Babe Zaharias will adorn the bridges with capsules about their significant contributions to the game. They symbolize linkage of the club’s storied past, present and future. Fifteen holes underwent renovation, and No. 1 is now No. 10 to add excitement down the stretch. Holes 16, 17 and 18 – now known collectively as “The Final Charge” – are formulated in the shape of a lightning bolt to become a “trifecta of finishing holes among the best in Illinois,” says Bechtold. The addition of multiple tee boxes gives the course renewed appeal to better golfers seeking added length and new golfers seeking shorter distances. Reconfigured fairways and bunkers, the addition of fescue on many holes for depth and definition, and new lakes make for challenging yet fair land-water hazards. Lohmann Golf Design led the modernization of the 35-year-old golf course, preserving the classic Killian-Nugent layout while enhancing strategic shot values for golfers. Floods which occasionally plagued fairways after heavy rains will no longer occur. Other new changes are a 9,100 square-foot putting green and a 3,500 square-foot bentgrass chipping area for a state-of-the-art learning center totaling 8,700 square feet. PGA-certified instruction on a 55-station driving range, plus the addition of a “FlightScope launch monitor” for scientific club fitting, has golfers improving their games. The clubhouse received a major facelift and a now boasts a modern-era ambiance. In the main banquet room that holds more than 300 guests, there is new carpet, wallpaper, lighting, paint, ceiling construction, bathroom upgrades and a new dance floor. Business meetings are first-class with WiFi, screens, LCD projectors and other accoutrements. A new, 8,200-square-foot event area with a majestic gazebo and waterfall makes for memorable weddings and other special occasions. “It’s mission critical to consistently upgrade existing facilities and parks for current and future generations to enjoy,” says Dean Bostrom, executive director of the HEPD. Providing first-class parks, facilities, programs and services for a dynamic community of more than 50,000 in the northwest suburbs of Chicago, the HEPD operates two community centers, a premier 18-hole golf course, state-of-the-art fitness center, twin ice arena, family aquatic center and 63 parks. In addition to Bridges of Poplar Creek Country Club, notable sites include the Prairie Stone Sports & Wellness Center, Scott R. Triphahn Community Center & Ice Arena, Willow Recreation Center and Vogelei Park. The HEPD won the 2009 National Gold Medal Award for Excellence in Parks & Recreation Management, the highest national honor in the public recreation category.